I finished this bad boy up last weekend, VRM and all. It sounds great at bedroom volume. I have not had a chance to really open it up. I'm waiting on a cab to get completely done. I am currently running it into a Princeton Reverb cab loaded with a 12" Cannabis Rex. I created a detailed build thread on the MyLesPaul.com forum. Looks Great!! Awesome build. I checked out the build thread too. Nice documentation of the process. I think what makes the Trinity kits so good is the Builder's Manual Stephen puts together. Covers theory, lots of pics, tweaks, troubleshooting. Anyways...congrats! I'm sure it sounds incredible. I got a good bit of email support from Stephen too. I'm sure he is almost as happy as I am that this is one is finished. Congratulations! Nice build. I finished mine just over 2 weeks ago and I still can’t get the grin off my face. You’ll really love it when you get to crank it up. I’m waiting for my head cabinet to put the final touch on it. I got my cabinet in, mounted the chassis, and installed the new Greenback speaker. First impressions are that it sounds a bit harsh and bright with the Greenback. The speaker is new, so I know some break in will help. However, I found a few threads here about taming the highs on the Plexi layout. It seems that a number of builders have thought it was little too bright. I intend to use the amp in a jam this weekend before making any decisions. It was not so bright with Cannabis Rex speaker I was using, but that particular speaker is known for mellowing out bright amps. IF I decide to mod it, I found a thread about adding a 100pf cap across the plates of the PI (V3). That cap looks to be a feature of the Plexi Mk II layout. It appears I could go direct to pins 1 & 6 of V3 as a test, without modifying the board. If I decide that it's too bright, is that the recommended first step? Which channel is too bright? And which input? I find the low input of the normal channel fairly dark and Tweed like. 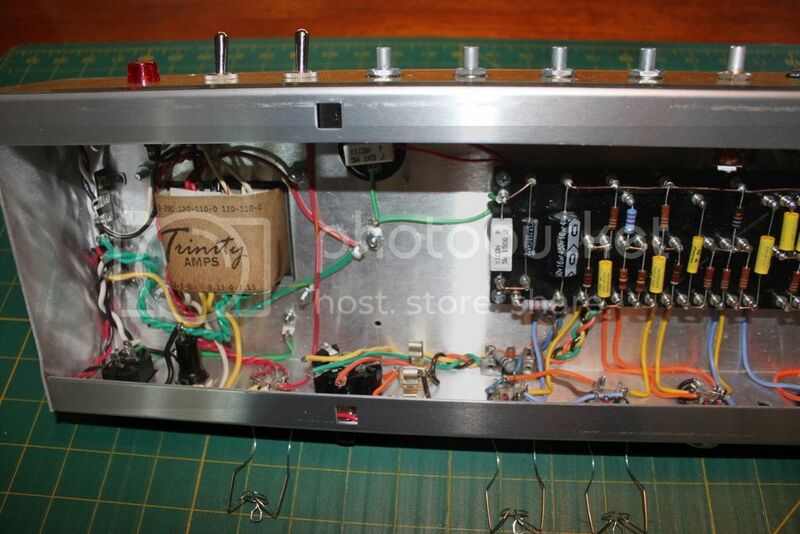 The 220uF cathode bypass cap is more like a Bassman. Pretty much all of them. It's just bright across the board. As I had mentioned, this brand new speaker might have something to do with it. However, it is not unlike what is described in this old thread. I was still running the treble/tone control pretty low with the Cannabis Rex speaker, but it was not harsh at all and sounded pretty darn good. I've been through the circuit over and over again, I do not find any issues. All controls function as expected and all voltages are in the ballpark of expected. Was wondering if this is just a bright circuit that might need some tweaking. You may be on to something regarding the Greenback. I’ve installed mine in my cab now and it is a brighter speaker than the one I had but in a good way. 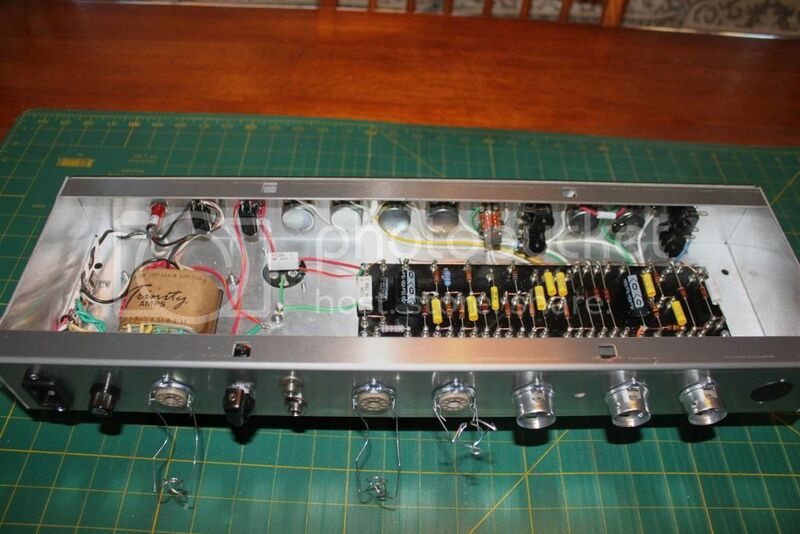 The previous one was dull and lifeless, a cheap Peavey of unknown origin. I had to back off the treble a bit but still lots of range to make adjustments. Speakers can really change your tone! I knew you had a new one too and was curious about your thoughts on it. I went out and jammed with my combo today. I have to say, it sounded great. Everyone was impressed by it. 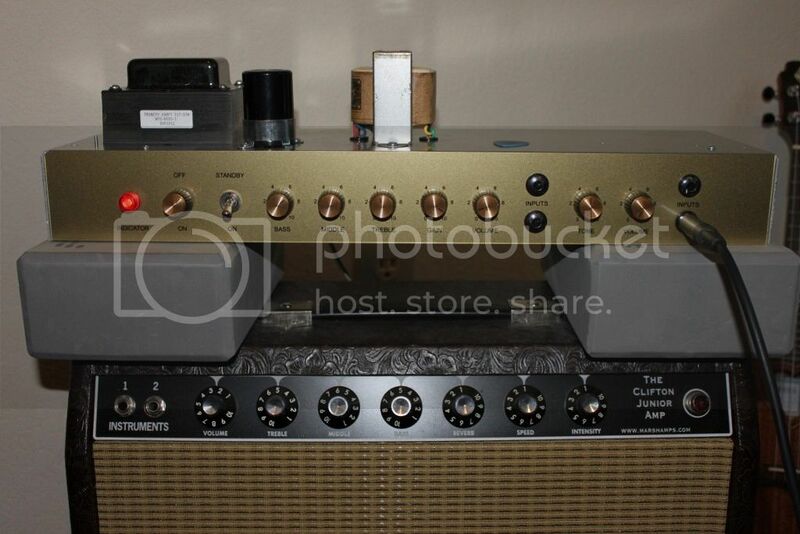 I was running the treble on the Plexi channel at 3, so very low. It cut through nice but didn't seem harsh. Afterwords, I took it to a friend, that happens to have a well broken in open-back Vox cab, loaded with a G12M Greenback. We swapped between his cab and my new G12M Greenback in the combo cab. We needed to move the treble control up to around 6-7 on the Vox cab to match the brightness of the 2-3 setting with the new Greenback. That pretty much tells me that its the new speaker. I am going to let this ride for awhile before considering any tweaks to the amp. Some people use a variac to break in speakers. I think I have one in my attic if I can find it. I honestly don't remember why someone gave it to me, but I think it's up there somewhere. Not sure I feel brave enough to try it. Apparently the accepted formula for AC power break in is sqrt[(power/ 3) * impermanence]. For my 25W, 16 ohm speaker, that would be 11.5 volts AC. You can use a variac. but keep it on the low side!! I use a 6.3VAC trnsformer. I ran 20 hours (not all at once) at 11.3v on the variac. I might have taken a little edge off, but I still need to run the Plexi channel with treble at 2-3. On the Normal channel I have the Tone at 0-1. I am thinking about adding that 100pf cap to the PI, like the MkII. If I want to do that, am I correct that it can go directly across pins 1 & 6 on the V3 socket? If I don't like the result, it's an easy reversal. Across the tube pins or on the turrets too. Is that suitable for testing this out? How would I beef up the tone of the Normal channel? I pretty happy now with what I'm getting from the Plexi channel but I have to run the Tone really low on the Normal side. That seems to cut the highs but the low end is still pretty thin. I do not find that to be an issue on the Plexi side.